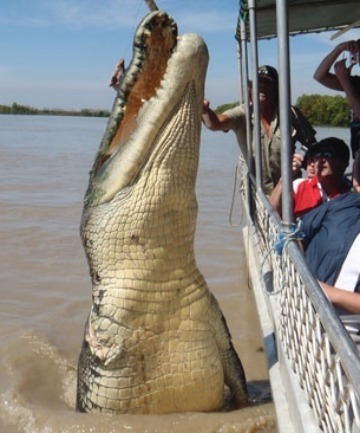 Check out this very hungry three legged crocodile about to attack this boat full of tourists! Well close - he's eating a piece of kangaroo meat that the boat's captain has hung out for him on a stick. Apparently Brutus the Crocodile lost his front arm to another crocodile or a shark and he's figured out an easy way to get some food is to make like a circus pony and jump put of the water on request.